A study led by Canadian researchers shows that bumblebees are disappearing in many areas where they lived several decades ago, and climate change is to blame. Unlike most animals—and for reasons not entirely known—bumblebees can’t move north to cope with warmer temperatures. They don’t fare well in warmer climates because they evolved in cooler regions, away from the tropics. This makes them particularly vulnerable to changing climatic conditions. To learn exactly how climate change is impacting bumblebees, researchers from Canada, the U.S., and the U.K. analyzed the history of 67 bumblebee populations in North America and Europe from 1901 to 2010. 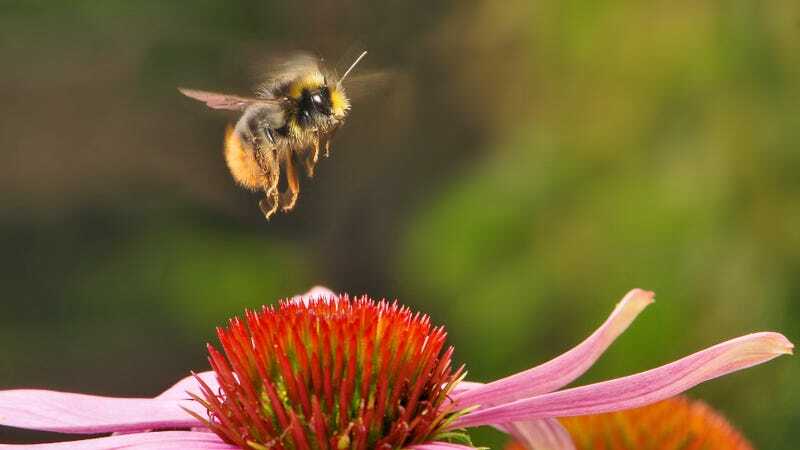 A survey of 423,000 observations of bees shows their populations have been on the decline since 1975; they’re being squeezed north by approximately 9 km (5.6 miles) a year, and are now extinct in their southern ranges to the tune of 300 kilometers (186 miles). The details of the study now appear at Science. The scientists also considered the role of habitat loss and pesticide use. They concluded that, while these factors are harmful to bumblebee populations, it’s climate change that’s the primary culprit. Not all entomologists agree with the findings, saying that the paper offers evidence of a correlation between climate change and waning bumblebee population ranges, but does not make the case that warming temperatures are the main cause. Instead, they say that a multitude of factors contribute to the bumblebees’ shrinking borders, and that a changing climate may be just one factor. The loss of bumblebees is a problem because we rely heavily on bees to pollinate our crops, said Alana Pindar, a postdoctoral researcher at the University of Guelph in Ontario. She co-authored the paper and took part in the news conference, which also included co-authors from the University of Calgary and York University in Toronto. Wild bees are actually better pollinators than honeybees, and bumblebees are better pollinators than other wild bees because they’re active for most of the year, from spring until fall, and can therefore pollinate a huge range of plants. Many other bee species that typically only pollinate a few species of plants for a few weeks of the year. To address the problem, some scientists say we should engage in “assisted migration,” which is exactly as it sounds: Because bees are mobile creatures, humans could physically relocate some bees north. But even then, the mystery of why bees can’t move north on their own will probably have to be addressed. Read the entire study at Science: “Climate change impacts on bumblebees converge across continents”. Contact the author at george@io9.com and @dvorsky. Top image by Bernie Kohl/public domain.